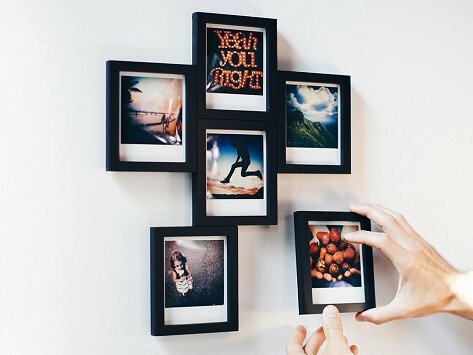 This modular magnetic picture frame system makes it easy to display—and switch around—Polaroid prints, 4" x 6" photos, and your fave snaps from Instagram (4" x 4"). One main frame screws into the wall while super strong magnets connect the other frames to it in any configuration you want. Polaroid frame system fits a standard 4.25" x 3.5" Polaroid photo and a single frame measures 5" x 4.25"
Instagram frame system fits a 4" x 4" square photo and a single frame measures 5" x 5"
Classic frame system fits a 4" x 6" photo and a single frame measures 5" x 7"
Dimensions: Polaroid: 5.5" x 4.5" x 4"; Instagram: 5.5" x 5.5" x 4"; Classic: 7" x 5" x 6.5"
Weight: Polaroid, Instagram: 1.2 lbs. ; Classic: 1.4 lbs. My wife loves this frame. She already has it on the wall. Great gift. This was a great idea, but the size was designed for specific photos, so we had to cut the ones we had to fit. Wish they came in a larger size. I love this idea, my only problem is the size. I’d like them to at least become available in 8”x10” or larger. magnaframe is a modular magnetic picture frame system that centers on one main frame (with a level built into it) that is screwed to the wall. Once you’ve got this main one in place, the five other frames connect to it magnetically and in any configuration you like. If you’ve ever tried to create a photo gallery on your wall, you know it takes lots of measuring and adjusting to get it all to look just right. magnaframe delivers that same visual impact, but in a much easier—and endlessly changeable—way. The set of frames is sized for Instagram (4x4) prints, Classic (4x6) prints, or Polaroids. And, as easy as it is to magnetically reconfigure your display, it’s equally easy to pop new prints in, too. Now your favorite snaps can break free from your feed and be proudly displayed where you can enjoy them.